PANTRY coordinator Nancy Spear and board president Gillian Wagner at Immanuel Presbyterian, one of the founding congregations. On a recent afternoon, the aroma of coffee and voices speaking in several languages filled the air in the cheery basement of Immanuel Presbyterian Church. There, children played and grown-ups chatted while they waited to receive boxes of food from Hope-Net, which is celebrating its 25th year of providing food to the hungry. It was 1988 when Windsor Square resident Bruce Friedman was asked to become a board member of Hope-Net. “The clergy of St. James, First Baptist, First Congregational, Wilshire Blvd. Temple, First Christian and others wanted to have a hunger and homeless charity to serve the mid-Wilshire area,” said Friedman. Friedman served as board president for 11 years. During that period, Hope-Net created food pantries at many of the congregations with a goal of having food available to those in need every day of the week. “The Wilshire Blvd. 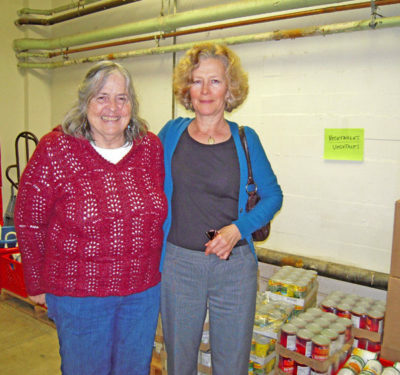 Temple food pantry was open on Sundays, while our Christian members’ congregations celebrated their Sabbath,” said Friedman. During the 90s, the board wanted to construct affordable housing for families. Funds were raised and a suitable property found, and Hope-Net built the Hope West Apartments on West Blvd. near L.A. High School. It was also around that time that the Larchmont Chronicle joined together with Hope-Net to plan the first Taste of Larchmont, which has continued annually ever since, and is a major fundraiser. Since its inception, Hope-Net’s food pantries have served more than three million people. Most clients are not homeless, but face food insecurity on a regular basis and need supplemental food to keep from going hungry. Through the group’s Food Link program, organizations and schools adopt pantries and collect non-perishable food items or monetary donations every month. Several sites also offer serve meals to assist the homeless, those without adequate cooking facilities and those without the ability to prepare meals. Sixteen pantries are operated by volunteers who contribute more than 16,000 hours of their time annually. Pantry staff members treat each client with dignity and respect. Quick bags containing pop-top cans and sandwiches when available are also distributed at Immanuel Presbyterian site—one of Hope-Net’s founding congregations—as well as donated clothing. Besides volunteering their time and donating food and clothing, community members help out in a number of different ways, said Spear, pointing to the colorful wall murals donated by a local artist, as well as shelves, which were an Eagle Scout project. Gillian Wagner, Windsor Square, regularly visits all 16 pantries as part of her job as board president, and she volunteers once a week at the St. James’ site. “You end up getting so much more than you give,” she says. For more information go to hopenetla.org or call 213-389-9949.